Marimbas built with Marimba One's Premium Keyboard and original Classic resonators are rare combinations of acoustic elements. They select the Rosewood bars of each keyboard from several thousand bars. The rich harmonics of the Classic Resonators blends perfectly with the dynamic volume, articulation, and resonance of the Premium keyboard. The new Marimba One Wave frame provides the best-designed and toughest quality-built frame on the market and comes with a heavy duty accessory bar to mount all of your percussion accessories. The frame is fully height adjustable utilizing their Izzy Height Adjustment System with gas springs in the end frames so it is effortless to raise and lower the keyboard. The Wave Lock System utilizes cam levers and was designed to make the set up and adjusting of the frame or accessory bar the easiest and fastest of any frame available. 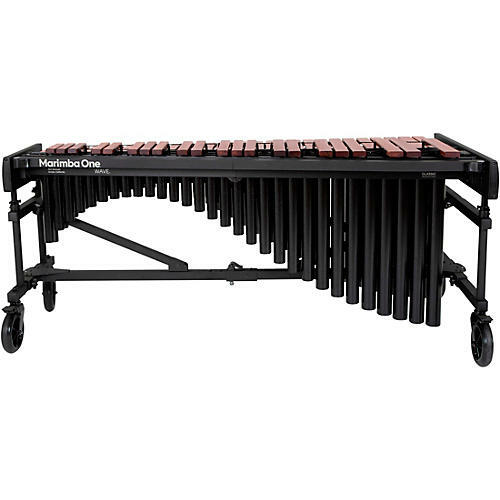 The Marimba One Wave rail is made of heavy walled lightweight aluminum for strength.